Social media had already made it clear that director Megan Lucas had put her heart and soul into this production, and this feeling was reinforced on reading the programme and learning that her own childhood toy version of the Space Shuttle Challenger was featured in the publicity, and on seeing the very clever (and presumably very technically challenging) set, glowing with projections of the Shuttle as we came in (definitely the right decision to start with the curtain up, so this could be seen). I know she had a good team around her, but to design the set, sound, CGI and projections as well as direct must have involved a clear vision as well as an awful lot of work and attention to detail - a labour of love. So before I say anything else I must congratulate Megan for a major achievement. The set really was clever, a bespoke assemblage of moving flats which allowed a large number of different scenes to appear on the Playhouse’s small stage without resorting to a plain black set - from a house to a bar to a motorhome to the Shuttle launcher to a circus. The integration of the sound and visual effects was excellent. I went on the first night and there were a few minor technical hitches, but this did not detract from the experience. What of the play? 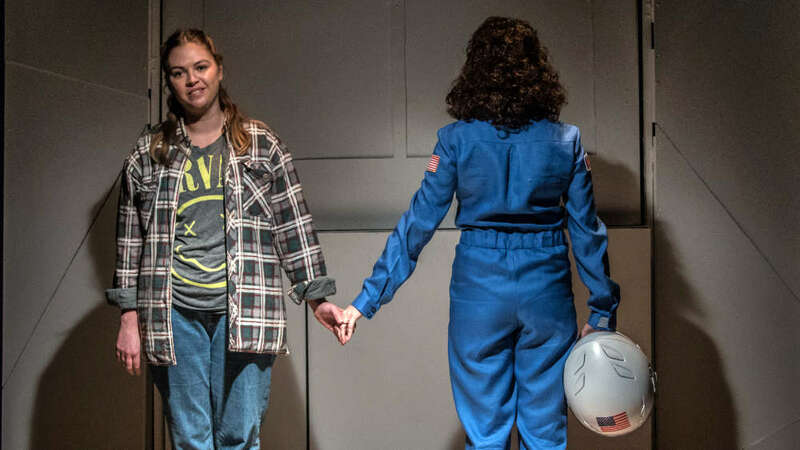 An unnamed Teacher has been chosen to take part in an unnamed Shuttle mission, but clearly this is a barely fictionalised take on Christa McAuliffe, the real life teacher on the real life Challenger mission which exploded in 1986. The play focused on her and a number of characters touched to a greater or lesser extent by the tragedy, including her daughter. It was episodic, but the different characters and scenes wove together pretty well. Claude Monet pops up regularly, and I’m not sure I ever really understood why, but you go with the flow, and I accepted the programme note that he paralleled the play in approaching the subject matter impressionistically, and his benign presence provided a different perspective and some welcome relief when things got heavy. Perhaps the most powerful moment came at the start of the second half, when we were reminded that the astronauts had not died instantly in the explosion, but survived in their capsule, with no hope of survival, for two minutes and 45 seconds until they hit the ocean, and then the director dared to leave the stage empty and silent for 2:45 while a clock counted down and we were forced to contemplate that length of time and that experience. As well as telling the story, themes of memory and time were explored. Certainly an interesting piece, with both moving and comic moments. The cast were all very good, with much better American accents than I could have sustained. I had seen them all before with the exception of Bex Fey (Teacher), so I knew the play would be well performed, but there was a clear sense of everyone working together well to realise Megan’s vision. Bex was utterly believable and lovable as the teacher and mom, as well as the excited but also nervous rookie astronaut. 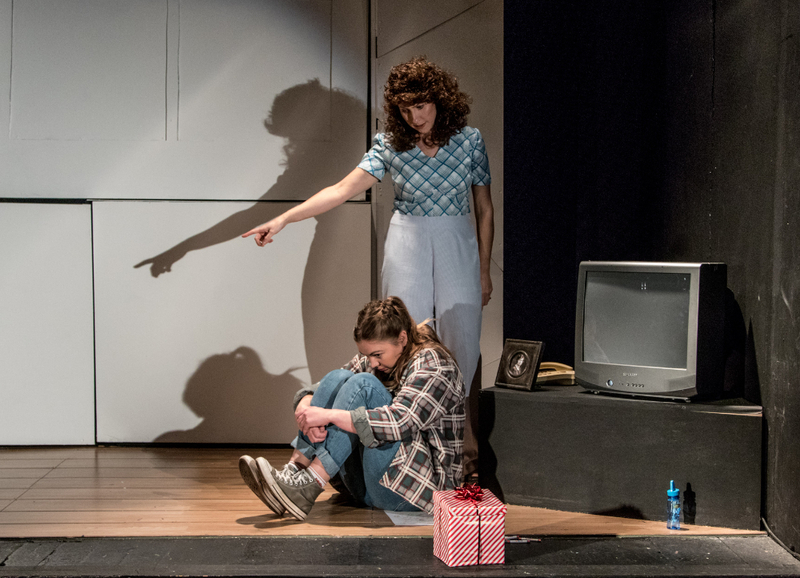 As her daughter, Julia Langley avoided ‘thcream and thcream’ caricature in showing a wide range of emotions in her face, posture and voice, and her realisation of the possibility and importance of flight provided a moment of healing for her and a fitting end to the play. As Monet, Lou Chawner had quite a tough gig I thought (see above), but was a very good healing presence. Lisa Wright as barmaid Donna was just the right kind of mother figure, and Jof Davies moved powerfully from good ol’ boy to guilt-stricken as the ground crew member. 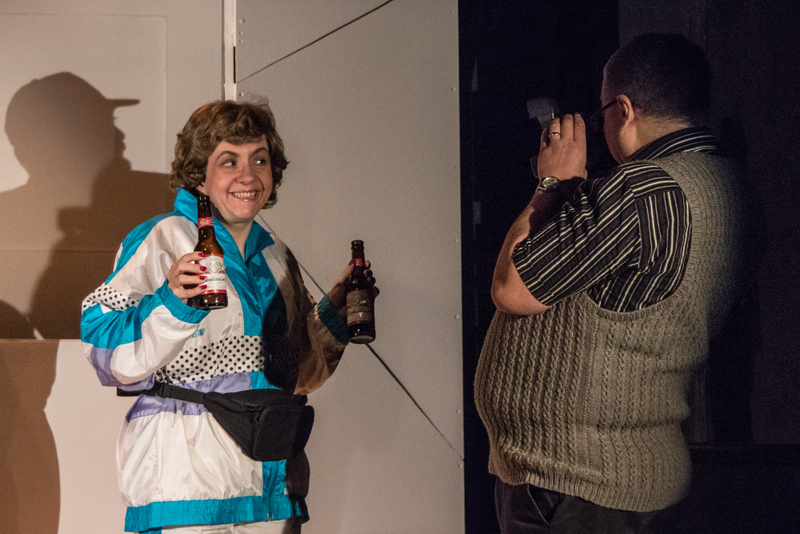 April Pardoe and John Myhill as the homely travellers Betty and Ed were really sweet and provided some of the emotional heart of the play (as well as comic relief), particularly when it fell to them to portray the disaster wordlessly, on their faces. I must also commend Lisa and April for their transformation into trapeze artistes. Well done also to those who pre-recorded audio or video contributions - they did not stick out, and it felt as though they’d come direct from contemporary recordings - as they should. And well done to all of Megan’s crew. So, an ambitious piece, ambitiously staged, but held together by Megan’s vision, for which everyone rose to the occasion. Congratulations! The disaster that occurred above the Florida Coast, 73 seconds into the 25th launch of the Space Shuttle, in January 1986, claimed the lives of the seven people aboard, and affected people across the globe. Defying Gravity tells the fictional story of seven of those lives, providing the surrounding atmosphere for this tragic event. Featuring Bex Fey (Blackadder, Bazaar and Rummage) as the Teacher, Julia Langley (Madame Bovary, Macbeth) as Elizabeth, John Myhill (Hamlet, Macbeth) as Ed, April Pardoe (Hamlet, Macbeth) as Betty, Lisa Wright (The Rover, Macbeth) as Donna, Jof Davies (It’s a Wonderful Life, Brief Encounter) as C.B., and Lou Chawner (Blackadder, Madame Bovary) as Monet, Defying Gravity swings, pendulum-like, between sadness and laughter. This ambitious production promises to explore the horizons of what is possible in community theatre. Masque Theatre's production is directed by Megan Lucas.